For this project its best to get all your Pine pre-cut as there are a lot of pieces that are needed. Use the material list as a guide but you could always have them cut wider or longer, depending on what size lounger you want. If you change the size of the Pine, remember to adjust the size of your brandering accordingly. Drill pilot holes into each end of the longer pieces and attach the sides using wood glue and screws. 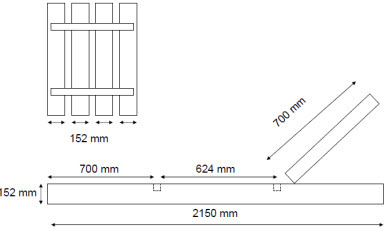 Measure 700m from each side and screw your two cross-slats (brandering) into place. Once these are in place, attach four of the pine slats onto the brandering making sure they are an equal distance apart. Now you need to build the two end pieces that can be raised up and down. Start by Attaching one of the 590mm brandering pieces to two pine slats. Place it right up to the edge of the pine. Attach a second piece of brandering to the other end of the two pieces of pine. Place this piece further in so it can fit inside the frame. Once you’ve got your frame built, place two more pine slats in between the first two, keeping the distance they’re apart the same as on your middle piece. To build your legs, attach two vertical pieces of brandering to one horizontal piece and then attach this with two hinges to the inside of the side piece. Now, attach the two end pieces to the inside pieces using the larger hinges. For the handles, drill two holes on all four sides of the long frame section and tie a piece of rope through them. Sand and varnish the whole thing, making sure to varnish the inside of the lounger.